is not an official Red Hook Studios product or product modification, and Red Hook Studios Inc. is not responsible in any way for changes or damages that may result from using the mod. 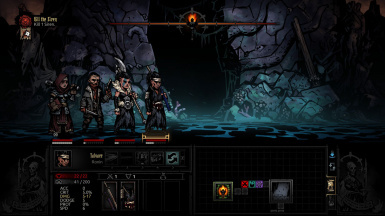 Furthermore, and the Darkest Dungeon logo are trademarks of Red Hook Studios Inc. All content in the game is Copyright Red Hook Studios Inc. All rights reserved. He should show up in the stage coach eventually, like any other heroes. A dishonored swordsman from the far East. 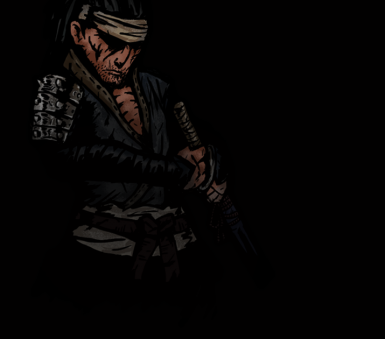 Once a proud samurai of a powerful house, his own greed and sins had led him down the path of ruin. Now, left with nothing, he came to this forsaken place seeking to fulfill the only purpose he has left; to die of a warrior’s death. Ronin is the textbook front-line glass cannon. Able to dish out high damage potential, but not very good at dodging, nor high HP. But more than that, he is a very techenical fighter, with few skills to help him over come his weakness. Certain skill combos and party group are needed to help bring out his true damage dealing potential. He also now can be build as a tank buster, be able to take down high defensive monster's protection. Woot, finally a brand new class (not just port from Nexus). Always want to do a eastern theme class, and a coversation on chat spark me to get to it. Took longer due to other work and stuff, but its finally done! (I think....). While didn't really bring any thing new in term of functionality (play like a cross of Good Girl and Assassin), I think he has a pretty good theme. -Flashing Blade: Basic Attack. Decent range. -Swift Cuts: Hits all enemies, use from back. -Battojutsu: A high damage attack only from Rank 1. -Calming Zen: A hp and stress self heal. Only use from back. -Swallow's Return: A weak ranage attack that boost your own damage. -Guard Stance: Increase your defense, and add a riposte that increase your dodge when take hit. 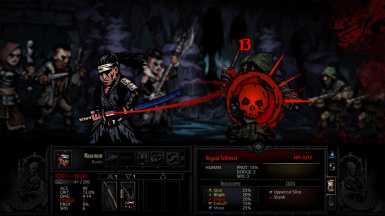 -Shingan: Debuff target, buff your own accuracy and crit. -Many of Ronin's skill have position restriction, but few of his skill moves him around too. Try find a combo that work well. -I also like to use Guard Stand at the start of the fight, since the dodge add from the ripo last longer. -Also could play in a team with other party that have move skills, so to help him posistion better. -If needed, use moving skill to try to move out of the front line, and avoid some of the strong attacks. Thank you for playing and supports. Feed back welcomes. Let me know if spot any bugs. Thanks. <Ronin> is not an official Red Hook Studios product or product modification, and Red Hook Studios Inc. is not responsible in any way for changes or damages that may result from using the mod. 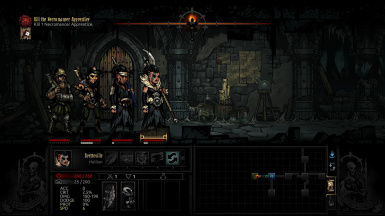 Furthermore, <Darkest Dungeon> and the Darkest Dungeon logo are trademarks of Red Hook Studios Inc. All content in the game is Copyright Red Hook Studios Inc. All rights reserved.